In the battle against fuel contamination, water is the most evasive target. Although there are many processes that remove water from diesel fuel, water is always present. This article explains differences in water-fuel mixtures, their prevalence, and comparison of removal methods. The article focuses on the most confusing water-fuel mixture – emulsified water. When it comes to water and fuel, water exists in three states: free, emulsified, and dissolved. At one end of the spectrum, free water is water that has fallen out of solution during phase separation, collecting at the bottom of a tank. This is the catalyst to microbial growth and a plethora of other damaging conditions. At the other end, always present in the fuel, is dissolved water. This is the state in which individual water molecules are suspended among the hydrocarbons in fuel. The amount of dissolved water saturated within diesel fuel is proportional to temperature (B. B. He, 2007) and relative humidity (P. B. L. Fregolente, 2015). In the middle, we find emulsified water. Emulsified water occurs when fuel and water are agitated, usually during re-fueling, running the engine, or as it passes through a pump. During these events, water is suspended within the fuel in the form of water droplets. Emulsified water can be further classified by the size of the water droplets: coarse (median droplet size of 300 µm) (ISO/TS 16332, 2006) and fine (median droplet size of 60) (ISO/TS 16332, 2006). 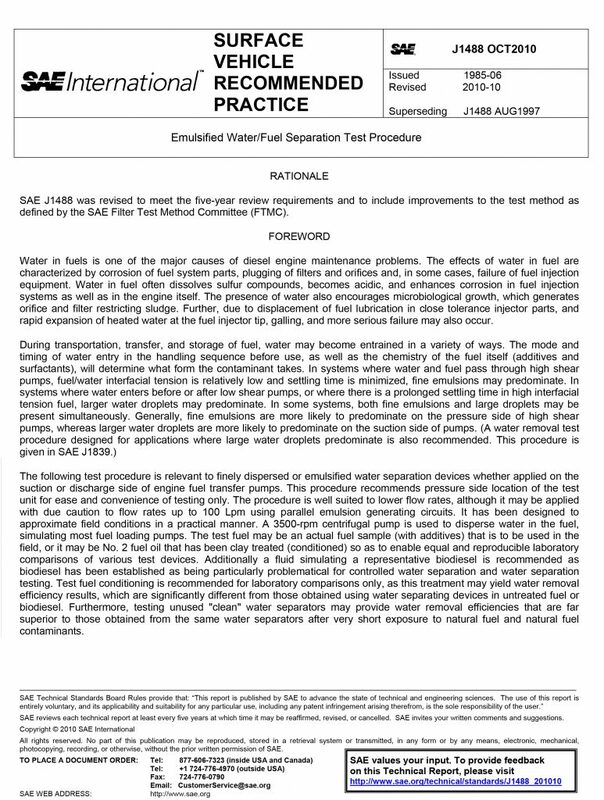 SAE International has issued two test standards to evaluate effectiveness of water removal from fuel, depending on the water emulsion classification: SAE J1839 and SAE J1488, for coarse and fine water emulsions, respectively. These test standards codify the testing methodology only and do not regulate the acceptable levels of efficiencies for water removal. “In systems where water enters before or after low shear pumps, or where there is a prolonged settling time in high interfacial tension fuel, larger water droplets may predominate”. (SAE J1488, 2010) This is true for fuel storage, where fuel is left “untouched” for a relatively long time, allowing water to settle. Examples of such fuel storage include emergency backup fuel systems for mission critical applications, such as hospitals or data centers. Removal of coarse droplets is evaluated by the test procedure SAE J1839. Coarse droplets removal can be accomplished using mechanical water separation. By using centrifugal water separation, or hydrophobic filter media, water can be removed from the fuel repeatedly, with minimal consumable usage. “In systems where water and fuel pass through high shear pumps, fuel/water interfacial tension is relatively low and settling time is minimized, fine emulsions may predominate.” (SAE J1488, 2010) This class of water emulsion is found after the fuel transfer pump on an engine, after the pump sheared the larger droplets of water into much smaller droplets. Removal of such water emulsion is gauged using the test procedure SAE J1488. The typical way to remove finely emulsified water in the fuel system is by using water-adsorbing filters or coalescing media. So, which water removal method makes the most sense for your application? For fuel storage, water and contaminants should be removed by a fuel recirculation system. Some recirculation systems are designed to remove water on the suction side of the systems’ pump while it’s still in the coarse emulsion state. This will extend the lifespan of the pump, plumbing, and water-adsorbing filters. Where water cannot be removed before the pump, water adsorbent filters should be used. Due to their higher cost, lower particulate removal efficiency, and slower effective flow rate, filtration methods after the pump should only be used as a last line of defense before the fuel enters the engine. In the end, both methods of removing water from fuel are acceptable for their respective design purposes. Coarse emulsion removal is more efficient and effective for fuel storage; while fine emulsion removal is recommended for on-engine filtration. B. He, J. C. (2007). Moisture Absorption in Biodiesel and its Petro-Diesel Blends. Applied Engineering in Agriculture, 71 – 76. ISO/TS 16332. (2006). Method for evaluating fuel/water separation efficiency. International Organization for Standardization. P. B. L. Fregolente, M. R. (2015). Removal of Water Content From Biodiesel and Diesel Fuel Using Hydrogel Adsorbents. Brazilian Journal of Chemical Engineering, 895 – 901. SAE J1488. (2010, October 22). Emulsified Water/Fuel Separation Test Procedure. SAE International. SAE J1839. (2010, October 20). Coarse Droplet Water/Fuel Separation Test Procedure. SAE International.